Do you always seek original souvenirs when you’re abroad? Do you prefer authentic objects, created in the very place where you buy them, possibly by a local? Well, then Plum Plum Creations by Arianna Sautariello is the perfect place for you. I bumped into Arianna and her Plum Plum Creations by chance, on Twitter. I saw one of her etchings and I immediately liked it. Curious to learn something more, I googled her and I found her website. I learned that she was born and raised in Venice, attending the Art School and the Academy of Fine Arts and learning the first rudiments from her mother (bookbinder). Other than a talented craftswoman she is an artist: she draws, paints (tempera, watercolour, ink and oil techniques), binds books and she is also a photographer. Why the name Plum Plum Creations? When she started selling her works online, Arianna had to chose a name. She told me: I honestly had no idea. But I wanted the name to have a colour or a fruit in it. I liked the idea of something coloured and genuine. I chose Plum cause I really liked the fruit, its colour shade and how the word “plum” sounded. Sadly “Plum Creations” already existed so I simply doubled the “plum”. A few weeks later I found out that she was about to open her own shop in Venice. Since I couldn’t attend the opening day, I decided to go and visit her about 10 days after. She was there with her mother and the dog Bic (whose birthday is a few days after mine, I found out eh eh). After a couple of barks, Bic decided I wasn’t a threat and returned to his basket. Arianna is very graceful. With beautiful long brown hair, a sweet smile and an incredibly good posture. Even in her apron (adorable by the way, red all covered in hearts) she looked very elegant. I know, it’s a strange thing to notice but I couldn’t help since I have a terrible posture. I always sit down askew and my back hurts. So when I see those lovely creatures that seems to stand straight with no effort I feel so fascinated! a major problem, so you must wipe all up and start over… maybe after 2 hours of work. That’s why it is so important to her that people understand what she does every day. Sometimes things turn out to be better than expected. 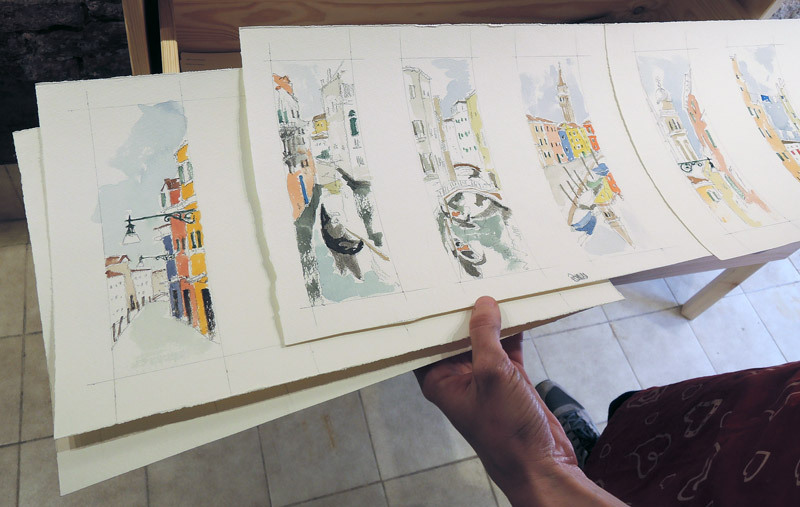 She then explained to me that she had been using other laboratories in Venice and Murano to print her works. But eventually she started to feel the need to have her own place. And what a place! 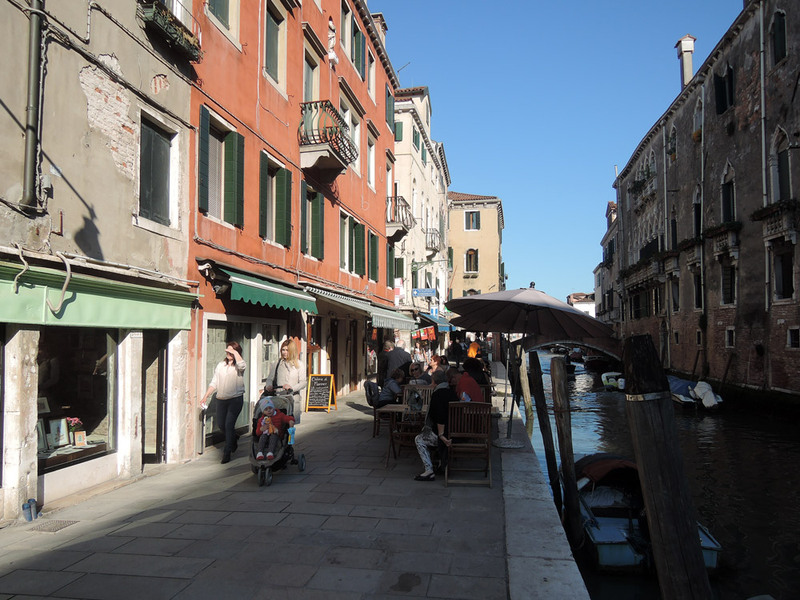 In Cannaregio, along a canal, just next to an osteria and close to several cicchetti bars. Her shop is so cozy, full of light and warm that I didn’t want to leave: exposed stones, wooden beamed ceiling, light wood furniture and all her works displayed. In the rear part of the shop you can see the working table full of brushes, colours, telephone books pages (perfect to clean the plates) and of course the tarlatana, also used to clean, but at a different step of the process. She was so kind to let me attended a whole print session explaining every phase. Unfortunately her mother left before I could think of asking her to take a photo of me and Arianna together. So we made a selfie. A very terrible one. Each of us is looking at a different point (none of us at the camera, obviously). Very blurry. I usually do not turn out well in photos but she is worse than me, considering that she is prettier. I don’t know what to say. In fact I decided not to post it. That said, if you’re in Venice you should stop at her shop in Cannaregio. If possible, she will show you the process of printing and you’ll be a part of her fascinating world. And that’s a short video I recorded while in the whorkshop. Here Arianna is drying the paper before printing. And please subscribe to my YouTube Channel by clicking on the red button on the left!